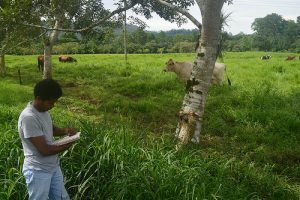 Pablo Chacón, a Guatemalan farmer, takes notes at the CATIE dairy farm and research center in Turrialba, Costa Rica, where he is studying agroforestry on an FAS-funded scholarship. Pablo Chacón, a young Guatemalan farmer who is studying agroforestry at the Tropical Agricultural Research and Higher Education Center (CATIE) in Turrialba, Costa Rica, can now show the people in his home community how livestock grazing and hardwood forests can co-exist and prosper. Earlier this month, he told me and other Foreign Agricultural Service (FAS) visitors to CATIE that the education he gained from his FAS-funded scholarship to CATIE has equipped him to be a change maker. Indeed, through his studies at CATIE, Chacón learned that his family and other in his highland community not only can, but should, grow trees in pasture fields. The trees provide shade for the cows on hot days and also help fight erosion. Helping this young Guatemalan become an agent of positive agricultural change exemplifies the capacity-building programs that FAS executes throughout Latin America, particularly in Central America. With a capacity built up over more than 100 years, the U.S. agricultural sector is, arguably, the most efficient in the world. It profits greatly from food and feed exports, including to Central America, where governments expressed the desire to recreate U.S. agricultural efficiency. The United States agreed to train farmers, processors and government policymakers to build stronger agricultural systems within their countries. We have made good on our word, and the technical assistance has been a win-win for our economies. For nearly a dozen years, since the CAFTA-DR trade agreement entered into force, USDA has been training Central American farmers to grow more food in ways that raise farmer incomes, minimize waste, reduce pests and safeguard the environment. Pedro Chacón’s story is just one example of how USDA promotes agricultural practices that help small farmers in developing countries produce food more efficiently and sustainably. But how does this benefit the United States? First, more efficient farming methods generate more income for farmers, who can then participate in the global economy. Second, all farmers use precious resources: The finite amount of arable land and water on Earth, combined with the challenge of feeding 9.6 billion people by 2050, will require farmers everywhere to be good stewards of our natural resources. Finally, the U.S. food and beverage industry, a thriving part of our economy, needs commodities – namely cocoa and coffee – that are not grown commercially in the United States. For every dollar of cocoa the U.S. imports, our own farmers sell another $2-4 of dairy, sugar and peanuts. And there are more than 130 million coffee drinkers in the United States. Central America is a main source of both cocoa and coffee, so USDA’s assistance in protecting the production of these commodities is also protecting a major driver of our domestic economy.